work of Financial Art, this rare, authentic issue artwork, printed by the world-renowned American Bank Note Company, is available as a Financial Collectible. Only 700 of these million dollar bill uncut sheets exist in the world. Fewer than 30 remain available to serious investors only. Get your Ultimate Collectible masterpiece today, before the next scheduled price increase.  View the many security features of the Million Dollar Bill, ONLINE!  The book that tells the amazing, but true story behind this Limited Edition, Ultimate Collectible.  I.A.M. Memberships - yes, you can join this exclusive club! Sophisticated Anti-Counterfeiting Techniques and Currency Grade Standards (including Latent Images, Microprinted Inscriptions, Invisible Iinks and more) were used in the printing of this hi-tech collectible work of financial art. With each of the next 10 uncut Million Dollar Bill sheets sold, we will include a portable UV light and 10x magnifyer for viewing the hidden details embedded in every sheet. 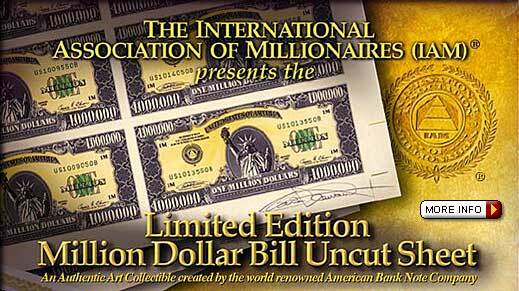 All sheets are signed and include a numbered Certificate of Authenticity for this ultimate financial collectible. All bills on every sheet are Individually Serial Numbered and are unique.